EPS Geofoam can be a great option when looking for a lightweight backfill, void fill or soil substitute for civil engineering. An EPS Geofoam Block is expanded polystyrene formed into a large lightweight block often used as a soil substitute for engineering and construction projects. Insulation Corporation of America (ICA) is a woman owned and operated EPS manufacturing company located in Allentown, PA. A large portion of ICA’s business is providing EPS Geofoam blocks for various civil and construction projects across the Mid-Atlantic region and selling directly to a network of EPS wholesalers. ICA will provide a free Geofoam quote for your project and arrange for direct delivery. Many state and government run transportation projects require contractors to use only approved building and construction materials. EPS Geofoam Blocks are now widely accepted across the country as an approved and preferred soil substitute. Geofoam backfill has many benefits that make it an attractive alternative to soil, sand and other materials including: lightweight, cost effective, easy to maneuver and durability. The Commonwealth of Pennsylvania’s Department of Transportation has published BULLETIN 15 – PUB 35, a qualified products list for construction of state-related projects. The website states, “This bulletin is a listing of pre-qualified materials that are eligible for use on department construction projects. The purpose of Bulletin 15 is to provide contractors, consultants, department personnel, manufacturers, suppliers, and others with easy access to a complete and accurate listing of approved products and their approved uses.” EPS Geofoam blocks are approved as a suitable construction material for projects. The woman owned, Pennsylvania-based EPS manufacturing company, Insulation Corporation of America, is an approved vendor for Geofoam projects in Pennsylvania. For your next project that requires soil or a soil substitute, ask the woman owned foam manufacturing company in your backyard for a competitive quote! No need for heavy equipment to install. Geofoam is stabilized, allowing for increased productivity and adhering to the construction schedule. That equates to cost savings on the job site. Rain delays due to wet soil and sand can cost job site thousands of dollars. Geofoam backfill will not wash away. Geofoam can be manufactured in different block sizes, various densities, and it is easily cut to fit any application. It is all about the math. Figure out what strength is required, and Geofoam can be manufactured to meet your specifications. To maximize efficiency, ICA has an adjustable mold to make custom size blocks to avoid waste. But if you have waste, EPS is also recyclable. In a good way! 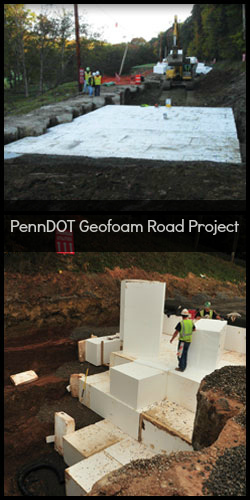 Like the unsung hero, Geofoam lays quietly below many projects, making them possible, safe, and long-lasting. All these benefits can stand alone, but what do they all have in common? Specifying long-lasting, predictable Geofoam saves MONEY. Is it worth shopping around when sourcing materials for a lightweight backfill? We think so! Ask Insulation Corporation of America for a free quote on your Geofoam project – you may be surprised. Please describe your Geofoam project below.